Modern pitching approaches are taking a bite out of Cafecito’s bat. The early season is always small sample theater. 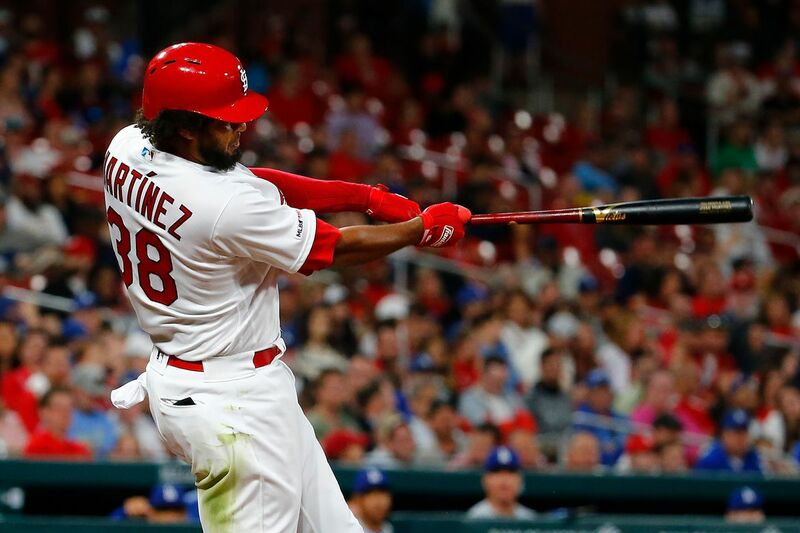 Much has been made of Kolten Wong’s power burst and Marcell Ozuna’s early struggles. Some of it might be sustainable, most of it- both positive and negative- is not. Sometimes the small sample is an extension of a larger trend, which brings me to José Martínez. Cafecito is off to a rough start this season, 4-for-5 performance on Thursday notwithstanding. Even with his Thursday outburst, he’s slashing just .259/.259/.333. His next walk will be his first of the season, and his wRC+ before Thursday was -20. Obviously, that’s not a new level of performance, as his 4-for-5 Thursday attests. That type of dreadful beginning isn’t going to continue. 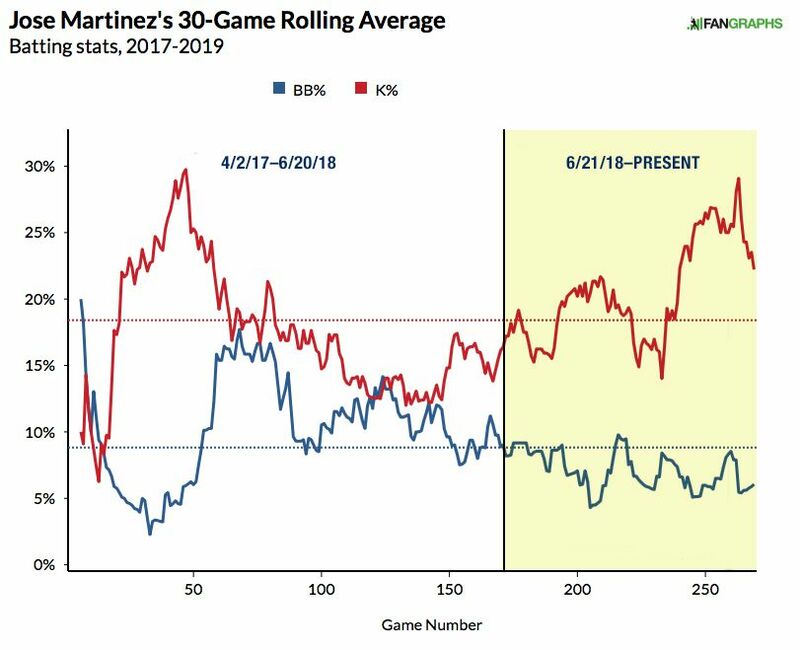 It’s worth noting, though, that it fits into a larger picture in which Martínez has seen his production slip a little since late last June. From the beginning of 2017 through June 20, 2018, Martínez slashed .311/.380/.512 with a 138 wRC+. That was 18th best in baseball, better than Bryce Harper, Anthony Rendon, and Nolan Arenado, amongst others. Since then, it’s a much more modest .288/.335/.401, a 103 wRC+ through Tuesday. Using Statcast’s xSLG (expected slugging percentage), he has an expected slugging percentage of .497 since June 21st. * It was .567 before that. If we focus just on slugging percentage on contact via Baseball Savant/Statcast, he’s gone from .626 before June 21st to .510 since, which is below league average (.537). Clearly, there’s a component of power loss. What’s putting all of this ice in our favorite cup of Cafe? 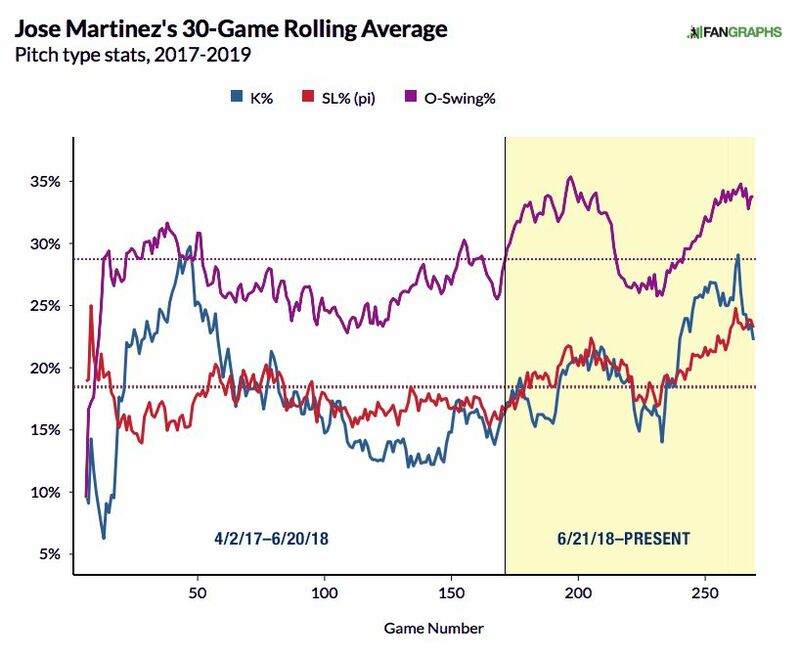 Let’s stick with Baseball Savant and look at how Martínez has been hitting the ball, both before and after our June 21st divider. His exit velocity is actually higher since June 21, and his percent of batted balls in the dead zone- less than a 5° launch angle- is lower. He’s not beating balls into the dirt and he’s still hitting the ball plenty hard. The percent of batted balls at optimal angles and velocity is down a little bit, but it amounts to about five batted balls since last June. It accounts for a little bit of the gap in production. The bigger trouble is his average launch angle falling 1.4 degrees. Even then, combined with the under 5° info, the implication is that he’s still hitting plenty of line drives. He’s had a very slight decrease in line drives- 26.4% before, 25.5% after, and 26.0% if we don’t include his 21 PAs in 2019. His homeruns per flyball, not in the table above, has a wide gap, going from 19.4% to 10.4%. Had he carried that 19.4% rate into the June 21st-present timeframe, he would have had four more homeruns. On the other hand, his average distance on flyballs and line drives was 280 ft. before 6/21 and 286 ft. after. Again, he’s still hitting the ball with authority, just not quite as much loft. Do you see that big scary alligator mouth in the yellow section? That’s what it looks like when you replace 3.2% of your walks with strikeouts and you cut your ratio of walks to strikeouts in half. It’s also a great way to lose a lot of production at the plate. Let’s go one step further. Obviously striking out a lot more and walking less is going to be a problem for every hitter, but what’s causing all of this? What’s different before and after late June, 2018? Whiff rates- the percentage of a hitter’s swings and misses to overall swings- are a great place to start. We can break it out by various pitch types. There’s a lot of potential for causality. His swing rate at pitches outside the zone has gone up, his strikeout percentage has gone up, and they all started happening about the same time pitchers decided to start throwing him more sliders. This also helps explain the trouble on sinkers and two-seamers, pitches that look just like sliders but break in different directions. You may recall a few weeks ago when I wrote about Jack Flaherty and demonstrated how he uses his sinker/slider combo to devastate hitters. Martinez cooling off is the inverse of that same effect, this time applied to a hitter getting worse results. There’s one final item to address- the increased whiff rate on high velocity fastballs (95+ mph). In our earlier timeframe, Cafecito saw 343 total pitches at 95+ mph and they had an average spin rate of 2278 RPM. Of those pitches, 4.9% had a spin rate over 2400 RPM and were in the upper third of the zone. In the later timeframe, it’s 161 pitches at 95+ mph, but the average RPM is 2369. Of those, 16.7% were over 2400 RPM and in the upper third of the zone. In other words, pitchers are just getting smarter. Hitting a high spin, high velocity fastball up in the zone is hard to do. They’re leveraging that fact to get easy swings and misses against all hitters. In fact, most of his problems are a result of the new wave of pitch design and pitch analysis. He’s struggling with sliders, sinkers, and two-seamers, which all pair together well when tunneled appropriately. He’s also losing contact on high spin/high velocity fastballs up in the zone. At this particular moment in time, this is how baseball looks. Neutralizing a 138 wRC+ hitter and turning him into a 103 wRC+ hitter, with more strikeouts, fewer walks, and less power is quite a testament to effective pitch design. Hopefully, Martinez and hitting coach Jeff Albert can find the antidote. Should the Cardinals Pursue Gio Gonzalez? There is a starting pitcher hitting the free agent market today. The Cardinals would do well to at least check in. Weekly farm recap 4/15-21: Sosa’s slugging leads Memphis to strong week Edmundo Sosa looks like he might be finding his power stroke for Memphis. The Cardinals 7 hitters are puttin’ in work - A Hunt and Peck Mostly Kolten Wong is puttin’ in work, but just let me have this, please.